This Exit: The Game review was made after playing three of the games. What is Exit: The Game? Exit: The Game is a cooperative escape room series from KOSMOS in which you are attempting to solve puzzles as quickly as you can. The games have all been designed by Inka Brand and Markus Brand. Each game in the Exit: The Game series has its own unique story, but all of the games have the same types of components and follow the same basic rules. You’ll get a decoder disk, a book that contains an introduction to the escape room and different types of clues, and three decks of cards. Unlike many of the other popular escape room board games out there, you might need to alter or destroy some components during these games to help you solve the puzzles. There are Riddle, Help, and Answer cards in the box. The Riddle cards are the key cards in the game since they are the ones that will have the puzzles (or parts of puzzles) you’ll need to solve to escape. The Help cards are there for when you’re having trouble solving the riddles. When you think you’ve solved a puzzle, you’ll use the decoder disk to see which Answer card you should grab. Each decoder disk has a symbol up top and three rings below it that have either numbers or other symbols. The symbol up top will be the same symbol found on the current puzzle you’re working on. Once you’ve lines up the three lower disks with the main symbol, you’ll see the number of the Answer card you should look at. Once you’ve solved all of the riddles, you’ll check how well you did in the back of the game manual based on how quickly you finished and how many Help cards you needed to use. And that’s about all you need to know to start playing Exit: The Game! 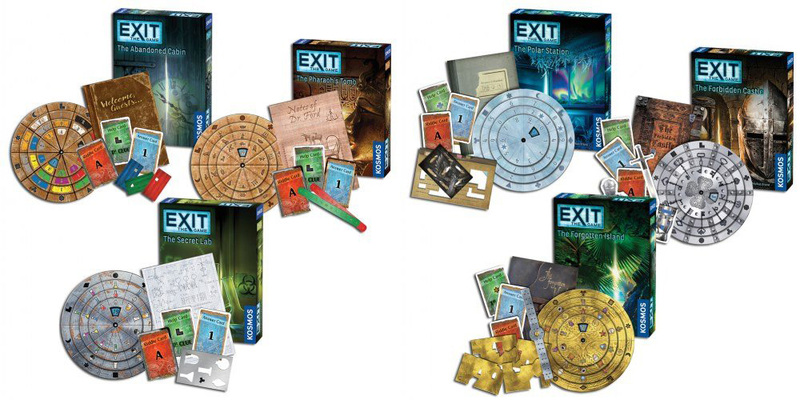 What Exit: The Game does better than the other escape room games is give you a great variety of puzzle types to solve. Sometimes you have to search for something, sometimes you need to figure out a formula, and other times you physically have to alter the game to solve a puzzle. There are quite a few other types of puzzles the designers have come up with, but I don’t want to spoil them. All of the puzzles are solvable by any group, which is not something that I can say about most of the other escape room games I’ve played. My group was stumped by quite a few of the puzzles, but after seeing the answers we always felt like we could have figured them out. The three games I’ve played so far—The Abandoned Cabin, The Pharaoh’s Tomb, and Dead Man on the Orient Express—have all had a good mix of easy-ish, medium, and tough puzzles. There is an app for these games, but I like that it’s not required. The decoder and the Answer cards are all you need to have to know if you solved the puzzles or not. It’s also pretty cool that there are multiple difficulty levels on each box to give you an idea of how tough each game is going to be. I don’t like that you have to destroy components in these games. And it’s not about the money, either. I just like passing these types of games along to other groups (especially groups with new gamers) after my group is done with them. Like most other escape room games, Exit: The Game really isn’t that great at higher player counts. You’re only looking at a few cards at a given time, so you really don’t need to have that many eyes looking at them. The artwork is just okay, especially when you compare it to the Unlock! artwork. It’s not bad, but it just doesn’t pop off of the paper like it does in the Unlock! games. Of all of the escape room games I’ve played, Exit: The Game has had the best and most clever puzzles. We had horrible scores in two of the three games we played, but each one provided us with a fun and memorable experience. I don’t know if this is the best escape room series yet—I have to play more of them to know for sure—but I do know that it has been the most consistent series my group has played so far. 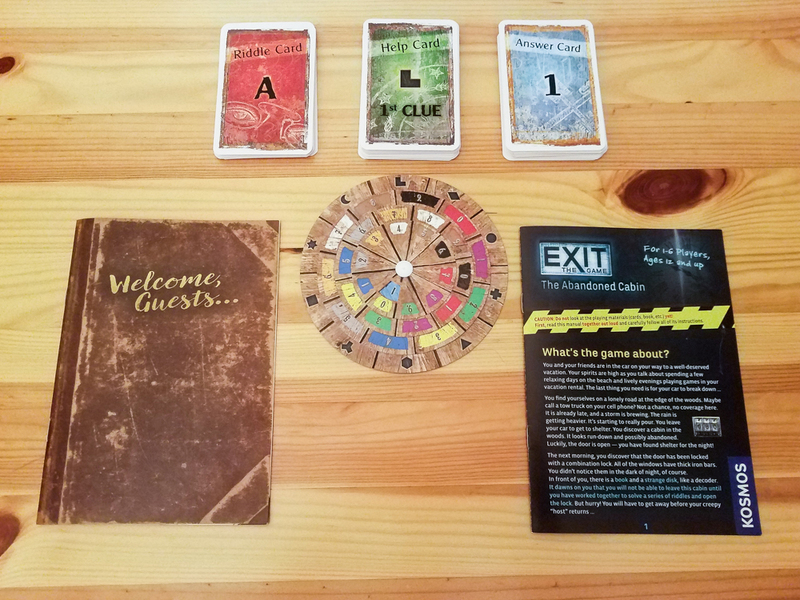 If you’re a fan of escape rooms or other escape room board games, I’m pretty sure you are going to have a fun time with Exit: The Game. The only reason I’d tell someone to pass on these games is if they don’t like the idea of having to throw a game away after playing it once. Thanks for taking the time to read our Exit: The Game review! To stay updated on all things cooperative board games, follow us on Twitter, Facebook, or via RSS.